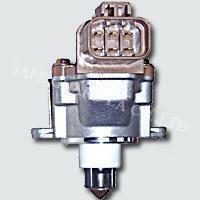 An idle air control motor (IAC), also called an idle air sensor control motor. ﻿In order to adjust the idle RPM of an engine, the cars need an idle air control motor (IAC) to control the speed of the electrically-operated valve, which is functioned as the manager of throttle body. In other words, IAC regulates the idle speed of engines. As a qualified manufacturer for cars component parts such as ignition distributor, ignition coil, ignition parts and idle air control motor (IAC), Safe Guard La. is well-prepared to provide you the quality products. Along with the certification of ISO: 9001, we also provide standard customer services. Accordingly, the quality of our products is guaranteed and has earned the trust from our customers all over the world. The idle air control motor we supplied is one of our best-selling products, for it can improve the performance of your car substantially. If you are interested in our fine products, please feel free to contact with us today! We'll respond to you immediately.